Volts & Bolts is WMS software based online video slot game. This is 5 reels with 3 rows and 50 fixed payline video slot game. The symbols of this slot spins throughout a dark laboratory. There are 2 bonus features available in this game. 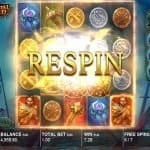 The first is free spin bonus feature and second is Robot Bonus Spins. 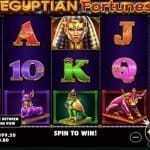 There are many jackpot cash prizes also available in this slot machine. The game includes symbols like J, Q, K and A, a brain, game’s logo and a electric meter. The game includes a wild symbol as well as scatter symbol. The battery is the wild symbol which can replace all symbols on payline except the scatter symbol. The robot and scientist is the scatter symbol. The first bonus feature is Robot Bonus Spins. This feature can be triggered during base game if you land at least 6 of the scatters symbols on active payline and this feature will give you five robot spins. This will yield in winning cash prizes. The more Robot spins you get and the more would be your chances of winning cash prizes from them. There are 4 jackpots available like Mini, Minor, Major or Jackpots. The Mini will give you 20x multiplier, the Minor will give you 100x of multiplier and the major will give you 2000x times of your total bet. 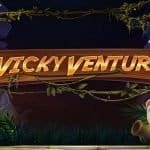 You can receive a jackpot of 5000 times of your total bet as well in this game. 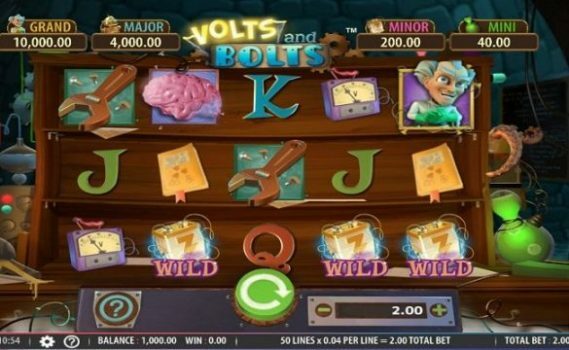 Volts & Bolts is a highly playable slot game from the makers of WMs software. Return of player percentage for this slot is above 96%, which seems to be great for players. The scientist is the scatter symbol which can be triggered if you land 3 or more of these symbols on active payline and that will give you 12 free spins. More spins can be re-triggered as well.